While Pilgrim was filled with an almost yin-yang sense of nature in all its wonder and terror, Teaching a Stone to Talk is more concerned with humanity: with feeling, with loving, with growing old. Nature is here, but it’s nearly a backdrop to Dillard’s thoughts on humanity. What possesses us to load ships up with supplies and seek out the North Pole? Why are we so different from weasels, who burrow in the ground, living wild and not hoarding anything they don’t need to stay alive? Nature is the foil here, the counterpoint to our fickle humanity. This essay, telling of Dillard’s pilgrimage to the mountains of Washington in order to observe a total eclipse, is harsh and gripping. Rather than reflecting on humanity, Dillard is caught up in the horror of the sky going dark, a literal shadow engulfing the eclipse-watchers, and how quickly everything returns to normal. The problem is, this essay is much better served in the middle, after we’ve heard about humanity’s utter ridiculousness in ‘An Expedition to the Pole’ and ‘In the Jungle.’ It makes for a good transition to the reflections of ‘Lenses,’ ‘Sojourner’ and ‘Aces and Eights.’ But aside from this nitpick, the book is excellent. As I wrote above, this book feels so different from Pilgrim. 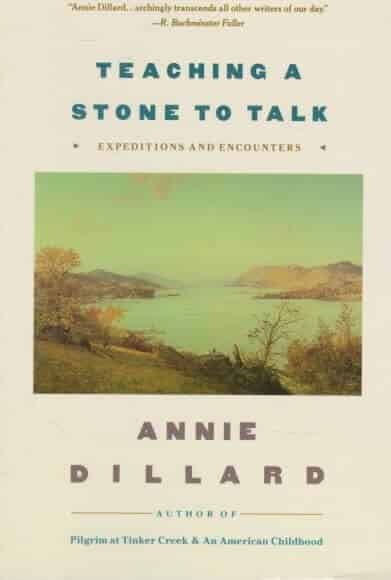 Pilgrim is a largely solitary affair: Annie Dillard and her beloved Tinker Creek, general pondering on the beauty and horror to be found in nature. Teaching a Stone to Talk is different, more humanistic and willing to laugh at humanity’s ridiculousness. At the same time, the book is deeply contemplative, spending a great deal of time on Annie Dillard’s daughter (in ‘Aces and Eights,’ the conclusion of the book and the longest essay by far), Annie’s own childhood, and the passing of time leading to death.